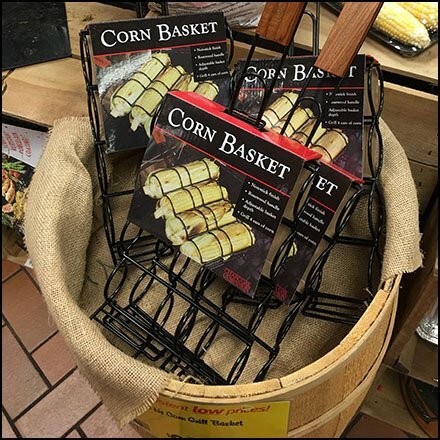 Right for the Season Wegmans rolls out this Corn Grilling Basket Rustic Barrel Merchandising right within Produce. Ready-to-roast ears of corn stretch off into the distance just beyond. Surely one or the other will motivate a cookout this weekend. Other corn holders and grips were nearby sold as Carded merchandise. But Corn Baskets were the hero and main item of attention assisted by the wood barrel. An unusual item and approach see this Corn Grilling Basket Rustic Barrel Merchandising in situ at Wegmans.